The perfect read for March Madness! If you are a basketball fan, this is the book for you. Attucks! 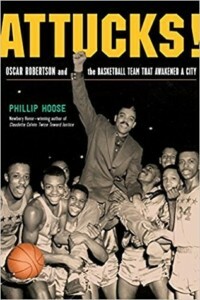 : Oscar Robertson and the Basketball Team that Awakened a City by Phillip Hoose (2018; 212 pages) tells the true story of the all-black basketball team at Crispus Attucks High School in Indianapolis that broke the color barrier in segregated 1950s Indiana. Oscar Robertson grew up poor in a black neighborhood in Indianapolis. He didn’t have much, but he loved basketball and practiced every change he got. And that was just like the basketball team at Attucks High – they didn’t have much, not even a gym at their school to practice in or host games – but they worked hard and had a passion for their sport. They shattered many myths about African Americans in sports and united the city of Indianapolis when they became the first Indianapolis team in 40 years to win the state basketball championship. If you’re interested in African American history, sports history, Indiana history or all three, this is definitely a book you’re going to want to pick up. It combines tons of play-by-play basketball action with information about the history of high school basketball in Indiana and race relations and equity in a major American city. I found it fascinating and kept reading passages out loud to my husband. This book is great for both teens and adults looking for a great read to round out your basketball season. Undefeated: Jim Thorpe and the Carlisle Indian School Football Team by Steve Sheinkin (2017; 280 pages). This is another great sports history book that contains a lot of play-by-play action and introduces readers to a culturally diverse superstar who changed his game. Superman Vs. the Ku Klux Klan by Rick Bowers (2012; 160 pages). This is a great read for anyone interested in civil rights.